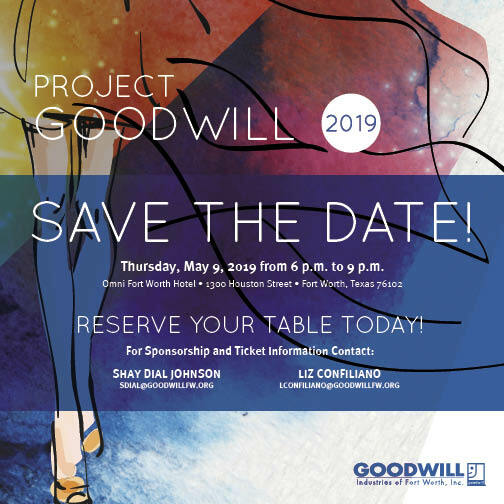 Goodwill Fort Worth will host Project Goodwill, a fashion show, design competition and fundraiser gala supporting the mission of the nonprofit. Aspiring designers from the community are tasked with designing wearable garments using $100 worth of unconventional materials from local Goodwill stores and presenting those looks in a runway show during the event. Previous participants have used materials including lampshades, album covers, tin-foil pans, air filters and more to complete their looks. The fashion show will be judged by industry professionals where contestants will compete for top honors in design materials and method, and runway presentation. Project Goodwill benefits the mission of Goodwill – to empower people with disabilities, disadvantages and other barriers to employment so they may achieve maximum independence. All proceeds go to the Moncrief-Ryan Scholarship Fund supporting initiatives focusing on providing jobs and job training for the homeless, at-risk youth, veterans, the disadvantaged and the disabled.